My name is Tung Kong Meng and I’m doing the Fourth Year medical program in PMC. 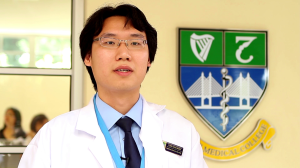 Why did you choose to study medicine with RCSI & UCD Malaysia Campus? Initially it was a very difficult decision for me to choose the medical college that I want to go to but finally I decided to choose RCSI & UCD Malaysia Campus because I believe it provides the best education for me. We have two and half years pre-clinical training back in Ireland, when I went to RCSI, and we have another two and a half year practical training in Malaysia, and as someone who will be working in Malaysia for the next 10 years, or 20 years, or perhaps for the rest of my life, I believe that the clinical training in Malaysia will provide the best teaching or the best education for me to enter into the working environment in Malaysia. What are the benefits of undertaking pre-clinical training in RCSI? Studying overseas is a whole different experience for someone like me, for someone who is from Malaysia like me. In RCSI, we have to follow the Western style of education where we have to go and research on certain topics that are being discussed by the lecturer. The lecturer will teach us, but he will give us a general overview of the particular topic, so the students have to go and do more research into that particular topic. I believe that that is one of the best ways to train our critical thinking and analytical skills. This is actually very different to the style of education in Malaysia where we were actually being spoon fed a lot. Did you enjoy studying with students of many different nationalities in RCSI? Yes definitely, in RCSI we have a multi-cultural society, back in UCD there are a lot of Irish people there but in RCSI there are a lot people there from all over the world. There are people from the Arab world, there are people from Canada, from the USA and Australia, so we have a very wide variety of people there. Every one of us has a unique personality, probably because of the different cultures we have and the different ways we are brought up, but all of us sit in the same lecture hall and we study the same thing, and get the same education. In terms of your student life in Ireland, what would you say was the best thing for you? It is very difficult to point out a single thing, but I believe that there are a lot of interesting things that I have experienced back in Ireland, like for example learning the culture of Ireland. Irish culture is very different to the culture of Malaysia, they have their own heritage, they have their own culture, and their own lifestyle, about which I believe I have learned throughout my two and a half years in Dublin. Do you think that having studied with students from so many different countries is valuable for you as a student and a future doctor? Yes, when we study overseas and study in Dublin, we get to make a lot of new friends and the medical program is not just in Malaysia, it is world-wide. So if I am to continue my research or to do study outside of Malaysia, I may need data from other parts of the world and I believe that my friends who will be in other countries will be able to help me or assist me in particular research work. In this way I can obtain data from many different parts of the world and therefore come up with the best solution for the health of the patient. Is RCSI & UCD Malaysia Campus’s international curriculum important for you for training as a doctor? Yes, definitely. RCSI & UCD Malaysia Campus is a unique college in fact. It is one of the sixth style medical colleges in Malaysia. Nowadays we have seen that a medical degree is very hard to be approved in other countries, but in RCSI & UCD Malaysia Campus we obtain a degree that is not only recognised in Malaysia, but worldwide. With the qualification from RCSI & UCD Malaysia Campus, we will be able to go to other countries to work there and to gain more experience outside of Malaysia. I believe that this is very important for anyone who wishes to work overseas. RCSI & UCD Malaysia Campus is definitely the best choice. Have there been moments that stand out in your mind since you have come back to RCSI & UCD Malaysia Campus? I have been back about three months now. It is a very different study environment to Dublin as the hospitals here are a bit smaller than back in Dublin. I have had a good experience of the hospitals in Penang. For example, I was allowed to take blood which I believe is very difficult to be allowed to do back in Dublin, and I have gained a lot of hands-on experience which is vital for being a good doctor. What was student life like in Dublin? It is very different and very fun. When we are students in Dublin, we don’t have to worry about anything except for our studies and passing our exams. Other than that we get to enjoy ourselves. We get to do a lot of things that a young person would normally do. For example, I did a bungee jump back in Dublin and this was a once in a lifetime opportunity. I have managed to visit a lot of countries in Europe and did a lot of Eurotrips. I believe it is something I will do only once in my life. Were the Irish people welcoming and friendly? Yes, I remember when I landed in Dublin airport, I landed on my own but I was shown to the correct bus stop and in the city itself they were very helpful and guided me around to all the best areas.